There is something to be said for a perfectly cooked pot roast on a Sunday night. Perhaps it’s me remembering those amazing Sunday dinners at my grandmas when I was younger, or perhaps its my love of bacon that gets this recipe my stamp of approval. 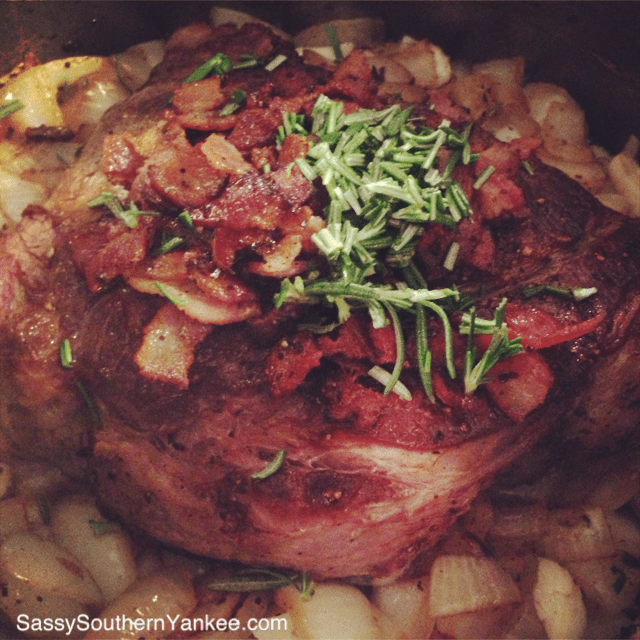 Either sway this roasted Garlic-Bacon Pot Roast is a winner in my book. The hints of smokiness from the bacon along with the sweetness of the garlic really bring out the flavor in this pot roast. I could go swimming in the Au Jus words can’t even begin to describe the depth of flavor it has. This is the perfect meal for company. It will get rave reviews, I promise! *** Please don’t be alarmed I used Purple Carrots from my local market. I love the pop of color; however if you want to use just regular orange carrots please feel free to do so. I absolutely love purchasing unique produce at my farmers market. 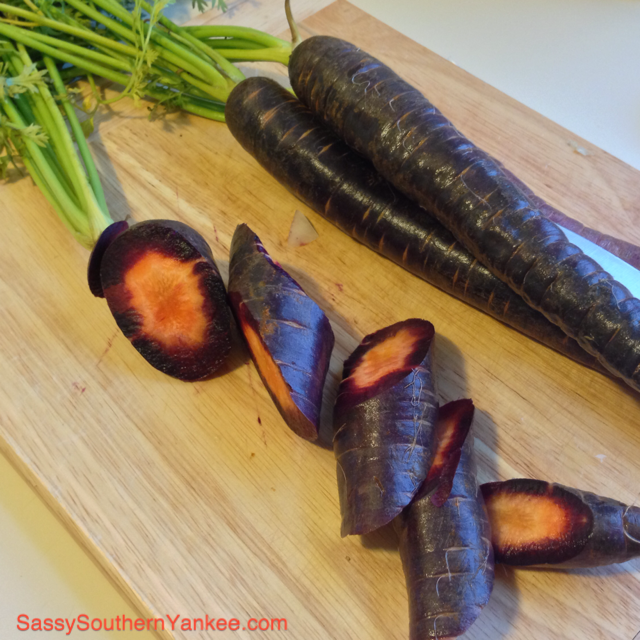 If you haven’t been to your local market take a look carrots often come in purple, yellow, orange, white, and pink varieties. You can even purchased the seeds to grow them yourself. They add a pop of color to any dish. Now let’s get started! Add the chopped bacon into the hot pan with the caramelized bits from the pot roast. Cook the bacon until crisp then remove the bacon and set aside with the pot roast. Into the same pan you have been using add the onions and smashed garlic. Use a wooden spoon to scrape all of the caramelized bits from the bottom of the pan as you cook the onions and garlic – there is soooo much flavor there! Cook the onions and garlic until they are tender and you see caramelization on them about 5 min. Return the pot roast and bacon to the pan with the onions and garlic. Add the broth, Thyme, and rosemary to the pot. Bring to a boil. Cover;transfer to the oven. Bake for 1 3/4 to 2 hours. Add the carrots, potatoes and celery stalk. Cover; bake 45 minutes more until the carrots and potatoes are tender. At this point your pot roast should be fork tender and your mouth should be watering. Remove the Pot Roast, Carrots, and Potatoes from the Au Jus, set aside on a platter and cover with foil to keep warm. 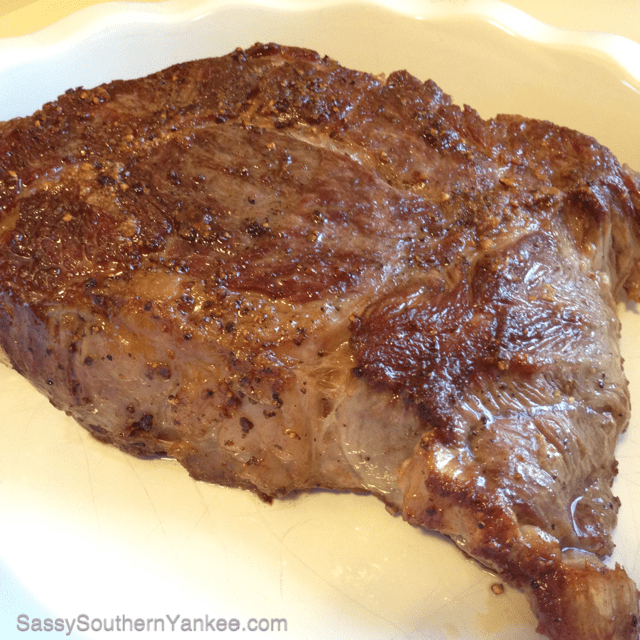 This also allows the juices to go back into the roast so that it is juicy and tender. Next skim the fat from the liquid and strain it to remove any bits. Return the liquid to the stove, bring to a boil uncovered for 15 min to reduce. We are looking to have a slightly thickened gravy. If you didn’t want to wait for the Au Jus to thicken you could always cheat and add a bit of corn starch and water to thicken it quickly. Slice the roast and then serve with the vegetables, reserved bacon bits and luscious gravy. Top with a bit of the fresh Thyme and Rosemary and you have dinner fit for royalty! There is something to be said for a perfectly cooked pot roast on a Sunday night. Perhaps it's me remembering those amazing Sunday dinners at my grandmas when I was younger, or perhaps its my love of bacon that gets this recipe my stamp of approval. 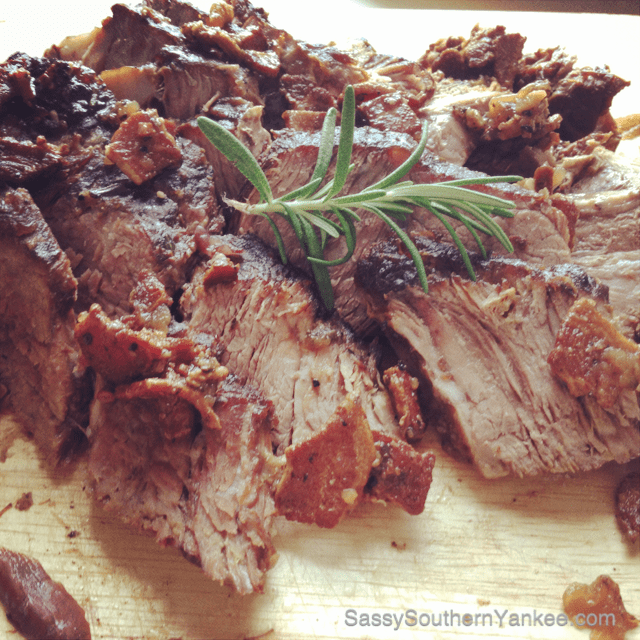 Either sway this roasted garlic-bacon pot roast is a winner in my book. The hints of smokiness from the bacon along with the sweetness of the garlic really bring out the flavor in this pot roast. I could go swimming in the Au Jus words can't even begin to describe the depth of flavor it has. This is the perfect meal for company it will get rave reviews I promise! Into the same pan you have been using add the onions and smashed garlic. 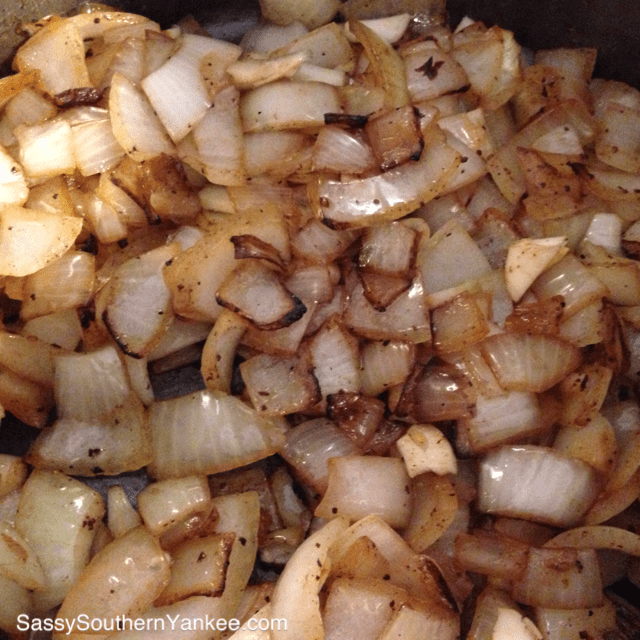 Use a wooden spoon to scrape all of the caramelized bits from the bottom of the pan as you cook the onions and garlic - there is soooo much flavor there! Cook the onions and garlic until they are tender and you see caramelization on them about 5 min. Return the pot roast and bacon to the pan with the onions and garlic. Add the broth, Thyme, and rosemary to the pot. Bring to a boil. Cover;transfer to the oven. Bake for 1¾ to 2 hours. Remove the Pot Roast, Carrots, and Potatoes from the Au Jus, set aside on a platter and cover with foil to keep warm. This also allows the juices to go back into the roast so that it is juicy and tender. Next skim the fat from the liquid and strain it to remove any bits. Return the liquid to the stove, bring to a boil uncovered for 15 min to reduce. We are looking to have a slightly thickened gravy. If you didn't want to wait for the Au Jus to thicken you could always cheat and add a bit of corn starch and water to thicken it quickly. 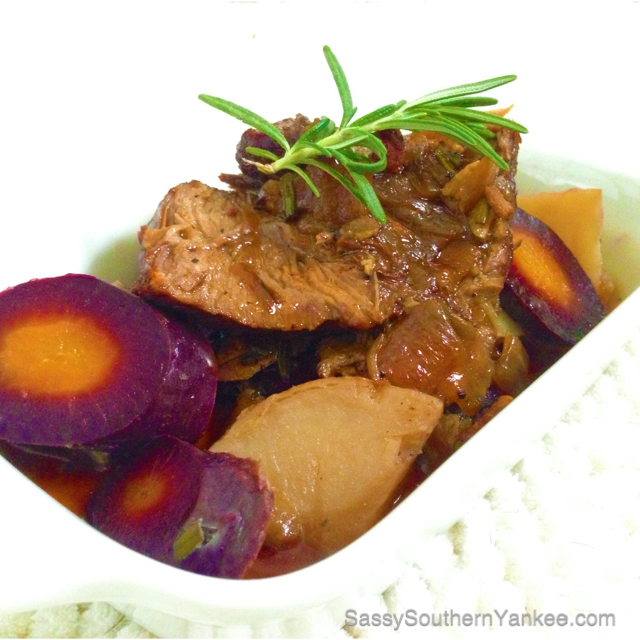 This entry was posted in Main Course and tagged Bacon, beef, carrots, Dinner, Garlic, Onions, Perfect Roasted Garlic-Bacon Pot Roast, Pot Roast, Pot Roast recipe, Potatoes, Purple Carrots, Sunday Meals, Winter Meals.